Dynamic Search Ads re-envision the way that text ad campaigns are managed on Bing Ads. All an advertiser needs to do is provide their website domain and a generic ad copy, then Bing Ads will take care of the rest. We will crawl your webpages of interest, then utilize machine learning algorithms to match suitable landing pages to relevant search queries, and dynamically generate quality ad titles for your ads. To better understand Bing crawling process, please reference Bing Webmaster Help center. Review and finalize your campaign settings. Advertisers can choose to target all webpages, specific webpages of their website based on the URL, category, page title, or page content (for example, all pages with “garden” in the title) or based on page categories of webpages which are automatically grouped for you. 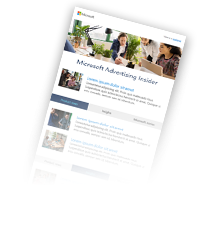 Learn more about Dynamic Search Ads on Bing Ads Help. How to participate in the open beta? If you don’t have an account team, please sign up and we’ll enable your account. If you have an account team, please contact your account team to sign up for this open beta. Advertisers can implement DSA through the Bing Ads UI, API and Google Import. In addition, if an advertiser is using Kenshoo as their tool provider, Kenshoo now supports creating and managing DSA campaigns, ad groups and ads within the Kenshoo UI.